The steady increase in complexity (less flat rate, more zones) would not matter in a world where the only traffic comes from Mom going online to send the kid or grandma only one package only once in a while. One computer, one webpage to fill out, one package to mail. 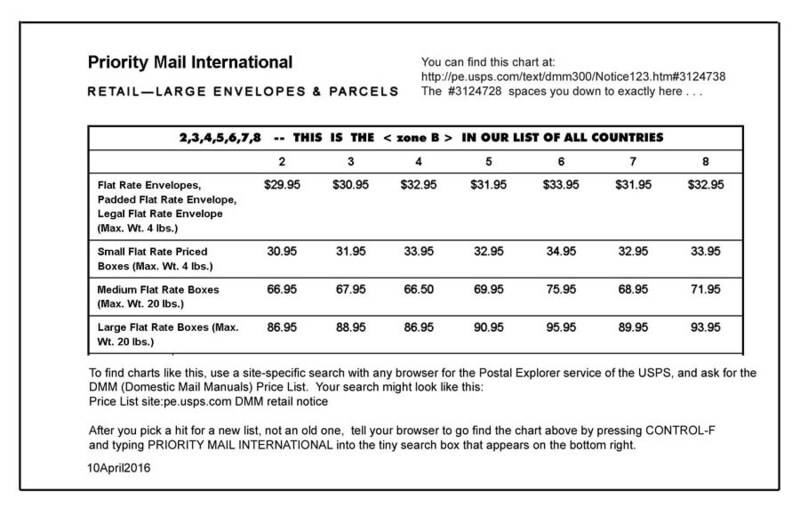 These informal postage pages are popular because getting any one thing mailed is so difficult even with a computer, even on a custom USPS mail-it-now page. But the volume does not come from getting one thing mailed to grandma. The volume lies with countless businesses shipping regularly to customers -- many packages. The smaller business players are suppressed, leaving only big players with automated shipping technology run in turn by still bigger players (Pitney-Bowes) or shippers (UPS, DHL, FedEx) who just pick up the item and never deal with the increased USPS complexity documented across these postage pages. In the name of "saving money" (with more and more rates), the United States Postal Service leadership is happy to drive the USPS into the shadows. The USPS governing board and its technical committees draw members from industries which will grow when the USPS doesn't. Death lies in the shadows -- Congressional oversight was relinquished when Nixon's Postal Reorganization Act of 1970 took away the Cabinet-level rank of the postal system. A Postal Rate Commission was given the power to set rates -- no Congressional debate, but the meetings were on the record with published proceedings. George H. Bush's 2006 Postal Accountability and Enhancement Act took away the Commission's openness, and it is in that darkness that the current march to stifling complexity has occurred. It was Bush's "Accountability and Enhancement" act that stipulated that the USPS should pre-fund the retirement of all workers so far out into the future that some would not have been hired at the time the USPS was ordered to declare "deficits" from trying to prefund their retirements. Public deficits require service shutdowns to save the system -- it's losing money! We see the same program in play when people pay no taxes on 11.18 million dollars (Trump's Dec 2017 tax bill abolishes inheritance tax for the first eleven million dollars), and health, retirement, and education must endure shutdowns to "save the system". Presidents Nixon, George W. Bush, and Trump were Republicans. The idea of running the postal system as a public service (e.g., firemen don't charge for the water) is not a Republican idea. 10April2016 Envelope and box are now priced differently, as complexity and cost of serving customers rises and usability and market success fall. 17 Jan2016 - no rate increase. 10April2016 Rest of World abolished, replaced by multiple, incompatible zonal systems, 17 zones here, 9 for int'l flats; see below. 27Jan2013 $23.95, up $7 from 2012 16.95, a 41% increase in 2013. 22Jan 2012 $16.95 up $3.70 from 2011 $!3.25, +28%. 27Jan2013 $40.95, up $ 8 from 2012 $32.95, a 24% increase in 2013. 22Jan2012 $32.95 up $6.40 from 2011 26.55, +24%. 27Jan2013 $59.95, up $12 from 2012 $47.95, a 25% increase. in this multi-billion-dollar, multi-billion-mailpiece system? Why incur demand elasticity failure by failing to make only bigger changes only more infrequently? 27Jan2013 $53.95, up $14 from 2012 $39.95, a 35% increase. 27Jan2013 $77.95, up $17 from 2012 $60.95, a 28% increase. On 17 January 2016, for international priority mail, the insurance level rose to $200 for medium and large flat rate boxes but there were no rate changes. REST OF WORLD ABOLISHED 10APRIL2016: REPLACED BY SEVENTEEN ZONES. the ROW (Rest of World) category was abolished and replaced by 17 zones: Canada, Mexico, and numeric zones 3 through 10, plus an individual country list (11-17) of Great Britain (UK would be a better column heading: The United Kingdom of Great Britain and Northern Ireland), Japan, France, China, Brazil, Germany and The Netherlands. This zonal system is incompatible with the zones used for International Packages (the ones with a 4 lb maximum). Thus a country will move to another zone if you try to price another service for it. Another way of saying this is that I cannot give you a wall chart of the world's countries and their zones -- the United States' postal service has abandoned any map of the world and instead creates its own worlds, a different one for each different service. One impetus for this complexification of postal zones is the increasing isolation of the United States as the only major nation still trying to deny the global coming of the metric system (Liberia and, to an ever-lesser extent, Myanmar/Burma are the other holdouts). Our maximum international weight of 70 lbs is an annoyance to other countries that regulate and run on a 30 kg (66 lb) maximum. Not every country is willing to humor us as Germany still does. Germany permits the 70lb boxes. Having separate "zones" for individual countries like Japan, China, Brazil and European Union members Great Britain, France, and The Netherlands is one way to force customers to accept a 66 pound limit when our nation will not accept the metric system. Compared to countries like Australia that converted in the 1970s -- public road signs, supermarkets and all -- our society seems dysfunctional. envelope $24.95 21Jan18; $23.95 22Jan17, up from $23.25 on 10April2016; up from $21.95 since 31May2015; envelope not same as box anymore. .
$62.35 21Jan18; $59.95 unchanged on 22Jan2017; $59.95 on 10April2016; why did they bother to change it 20¢ from $59.75 since 31May2015? On 27Jan2013, these prices are up 24%, 35%, 41%, more. These postage costs are rising more than ten times the average 2% rate of inflation (2009-2012). With the US Postal Service wants to take your money, they take whatever they want. When the government is obligated to give you Social Security money, suddenly they can't make the Cost of Living Adjustment. How are cost of living adjustments doing elsewhere? Penalties frozen into the law for white collar crime have no COLA (Cost of Living Adjustments) at all, and gradually disappear --fines become as small as a "rounding error" for large corporations. The missing column 1 is Canada. Column 2 is Latin America: Argentina, Brazil, Chile, Ecuador, Mexico. But some countries are in the "doghouse" column (8): Costa Rica, El Salvador. Column 5: India, Norway . . . naturally, look what they have in common. Column 8, doghouse: Hungary, Greece, Algeria, Russia, South Africa, Taiwan, Bangladesh, Uganda, Cost Rica, El Salvador.